I guess, after an 8 year hiatus, dissent is patriotic again, not mere racism. I assume the moribund anti-war movement and the screeching harpies of Code Pink will rise from their long slumber of ignoring Obama's actions they so vociferously protested under Bush 43. The old scripts are being dusted off and the past will again be prologue. Rickvid, there are some things that we will NEVER be rid of: the people you mention and hemorrhoids. Nice to see a new topic up. I participated in a few of the Anti-war demonstrations in the 1960s. I even had my little garden in Peoples Park in Berkeley. There was some anger back then, but what I see today goes way beyond those days. During one demonstration, I even picked up trash that other demonstrators dumped in the street. The most I got was a scowl from a couple of guys. 180 degree turn, and only leftist speech is allowed. All other comments are racist, sexist, homophobic, fascist, unsafe, etc. I expect we will see a lot more of it. Here is a new poem (sort of)and off topic. The way of corruption and death. Out, out, brief candle! "180 degree turn, and only leftist speech is allowed. All other comments are racist, sexist, homophobic, fascist, unsafe, etc. I expect we will see a lot more of it." ^^^have you forgotten what you voted for, Havers? In what category would you put our future president in? I mean, where he wants to grab women??? How would you categorize that comment? I don't get your ridiculous poem..Hillary, who has served for decades in politics (helping women rather than harassing them like the Trump, the assaulter in chief) is a "brief candle" OMG, you people are really delusional. "I guess, after an 8 year hiatus, dissent is patriotic again, not mere racism." What are you? A deaf, dumb, and blind deplorable without a TEEVEE or a functioning memory? How would you describe the last 8 years of un-hiatused dissent? How many times did Mitch promote his failed meme of making President Obama a one term President? Do you recall the Tea Party? I guess their, seemingly endless, public display of stupidity doesn't count in your dissent book. Obama wants Death Panels! Obama will kill Grandma! Obama is a Kenyan! Obama is a Socialist! Obama is a Marxist! Obama is a Communist! Obama is a Gay! Obama is a Fascist! Obama is a Mooslim! Keep government out of my Medicare! Obama is a Hitler Nazi! Tea bag Obama before he tea bags you! I guess riots in the street and voices of opposition writing and talking are concepts too difficult and confusing for some here. Haver, the Berkeley Free Speech Movement was NEVER about actual free speech. It was always a tool of the Students for a Democratic Society and other self-deluded peudo communist groups to suppress all speech with which they disagreed. Today, such actual free speech is called "hate speech" and is disallowed in business, academia, etc. Ayn Rand wrote an interesting historical analysis of the BFSM, showing just how very few people pushed it, and how very many cowards in policy positions knuckled under to their pressure. 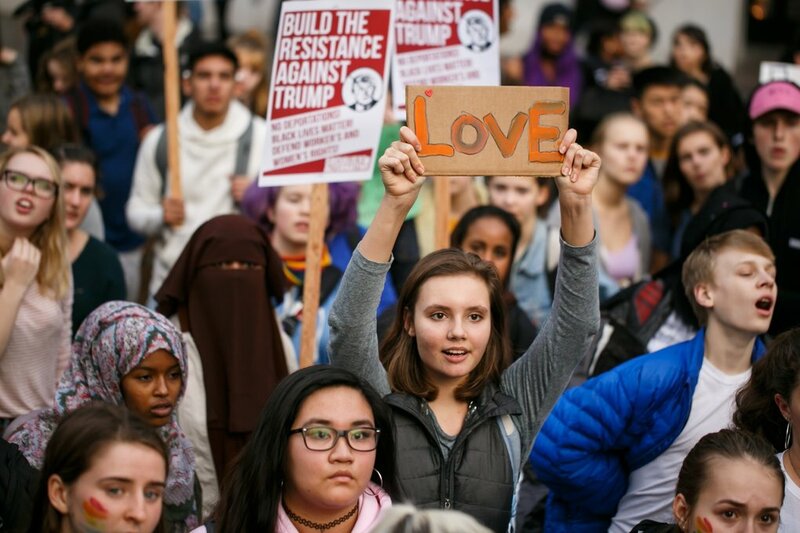 Remember, love trumps hate, UNLESS WE LOSE! THEN BURN IT DOWN! I don't deny that I was taken in by the the Free Speech rhetoric, and the radicals that were behind it. But this was also the era of ACLU defending the KKK's right to march, and other things that would seem strange today. We called ourselves Liberals back then, even if we were Republicans. Being a Liberal meant many things, but was antithetical to socialism. Time, and the movement further left by the democrats, has forced me into the 'conservative' camp. I believe Trump is an old time New York Liberal and I sense that I am more in alignment with Trump's philosophy than I am the statis GOP. Strong defense, but anti-war; fiscal conservatism and lowering the deficit; streamlining and cutting the cost of government; using the private sector to solve problems, but watching them and forcing them to be efficient; removing the corrosive effect of the influence pedaling in D.C. i.e. The Swamp! It will be an interesting time. A republican liberal democracy is the worst kind of government, except for all the rest, as Winney might say. And ribbit, as usual, misses the point entirely. Not that dissent did not exist, rather than ANY dissent from Obama's policies was immediately labeled racist. As though if Obama was a white guy, we'd all have been totally enraptured with his administration. The level of thinking was, and is, rather muddled. Havers: "Strong defense, but anti-war; fiscal conservatism and lowering the deficit; streamlining and cutting the cost of government; using the private sector to solve problems, but watching them and forcing them to be efficient; removing the corrosive effect of the influence pedaling in D.C. i.e. The Swamp! It will be an interesting time." Why do republicans still think that they are fiscally responsible? Your party puts us into huge debt every time they take over. And why do you all worship the big hypocrite Ann Rand? She sure loved being on public assistance i.e. WELFARE, lol. The mantra always is this: Do as we say and not as we do. Hurrah! Dissent is patriotic once again! I have some serious reservations and concerns with Trump; however, I also see many things that are causes for the first real optimism I have had in many years. That said, I am disgusted by the know-nothing useful idiots that are planning to disrupt and destroy during Trump's inauguration. I recall denouncing all of those tea partiers and conservative groups that protested Obama's inauguration and tried to shut it down with their civil disobedience and violent protests. Oh wait... there weren't any such protesters back then. And these damned fools have the audacity to tell us that "love trumps hate". I guess you can hate and cause destruction if your "loving" side is the one that loses the election. GOOOOOOOOOOOD Morning Racists, Pepeistas, Bigots, gops, nutters, Trump apologists, and low info voters! Tuff like for your lot coming out in the news yesterday. Yep, one of your fake newsers got caught and got himself fired. Looks like you'll have to pull fake news out of your good old standbys like Breitbart, Whirled News Daily, Fox of course, and yerownasses for a little while. A Republican legislative aide in Maryland who was behind a fake news site that accused Democratic presidential nominee Hillary Clinton of election-rigging was fired Wednesday. Is that MAGA! or what? rbb, when you say "fake news", do you mean stuff like "the gentle giant", or "hands up don't shoot", or perhaps my favorite of "a video was behind the BenGhazi attack"? The Christian Times Newspaper did the right thing in firing the "faker" on the spot. Now if only the rest of our national leftist media would have followed that example instead of perpetrating even more false narratives. Sorry you are having such a hard time with this transition, rbb. As President Obama told us though, elections have consequences. The orange Grim Reaper is about to take the stage, God help us all. The orange man and his tacky family (Tiffany and Ivanka are in matching outfits, made in China) are making a mockery of the U.S. The small crowd is filled with fat old white men with their stupid NRA hats. Not many people on the street though, Obama had millions...the protesters will outnumber the Trump supporters. You Troll you......How many of the useful idiots do you expect to hook? May your blessings continue. MAGA! There is no "I" in Good-Bye! If any of those tender, young snowflakes need comforting, I have good, strong arms, and a " cry room" at home. Trump's campaign speech that HE clearly wrote himself, lol. Remember Barack and Michelle's elegant dance with BEYONCE there singing? Who was singing that Frank Sinatra song??? OMG- and where was Ted Nugent?! -and where were the people? This will go down as the most depressing day in history for the U.S. and the most pathetic inauguration. Enemous / Reliably Blathers Bilge will never come up with anything an adult would care about. Crabs- obviously MILLIONS of people care that a life long con man has stolen the POTUS...they outnumbered the idiots inauguration by MILLIONS. Obama decreased the deficit, dumbo will increase it while getting rid of healthcare, PBS and NPR..oh, wait, but you only care about FOXXXXX.